Drupal 7 is said to have a code freeze this September and as far as I heard Dries has no plans to release Drupal 7 until all the critical issues are resolved. 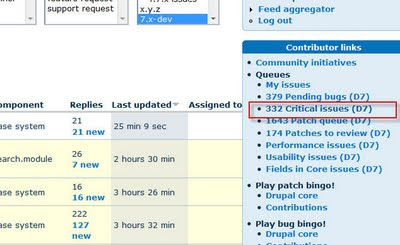 Till today’s date there are 332 critical issues to be resolved. View more presentations from beejeebus. * Fully rewritten database layer utilizing PHP 5’s PDO abstraction layer. * Added query builders for INSERT, UPDATE, DELETE, MERGE, and SELECT queries. delayed inserts, and other features. * Added support for the SQLite database engine. * Protected cron.php – cron will only run if the proper key is provided. Portable PHP password hashing framework. * Improved installer requirements check. * Provided descriptions and human-readable names for user permissions. * Removed comment controls for users. a “slimmed down” install profile designed for developers. file copy to the includes directory). * Added an edit tab to taxonomy term pages. * Redesigned password strength validator. * Redesigned the add content type screen. * Highlight duplicate URL aliases. * Renamed “input formats” to “text formats”. * Added configurable ability for users to cancel their own accounts. objects in a single database query. * Hook API documentation now included in Drupal core. * Added OPML import functionality for RSS feeds. * Optionally, RSS feeds may be configured to not automatically generate feed blocks. syndicating RSS and Atom feeds. * Added test framework and tests. to time zone names, e.g. Africa/Abidjan. fallback to the system time zone and will have to be reconfigured by each user. * Contributed modules with similar functionality are available. certain e-mail addresses and usernames is now available as a contributed module. implemented at the operating system level. * Converted the ‘bluemarine’ theme to a tableless layout. and file_validate() functions and corresponding hooks. preserved but renamed to file_unmanaged_*(). * Added support for mapping domain names to sites directories. And, those are exciting new features as always a new Drupal release has lots of things to offer. 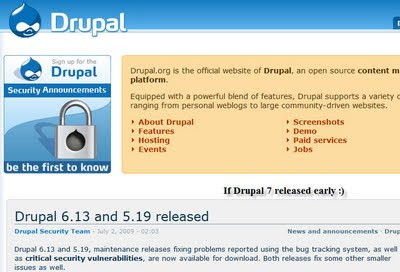 Let’s wait for the Day Drupal 7 is finally released.